Here’s another soup to warm you up! I made this last weekend (I’m a bad blogger sometimes) and realized that I never posted the recipe. I’m allowed to be lazy, too! I can’t get enough of chorizo! It’s so tasty and I love the idea of adding it to a soup. It adds a nice depth and a chewy little surprise in some bites! 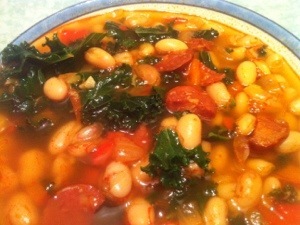 If you’re looking for a vegetarian soup, check out my last post on a lentil and swiss chard soup! 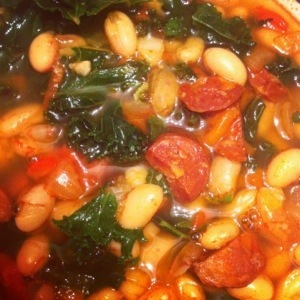 I’ll post both ways to make this soup (using canned or dry beans) and depending on how much time you have you can choose which way to make it. Deal? In a Dutch oven or large pot over medium heat combine water, chicken broth, bay leaves, and beans. If you’re using canned beans this step will be only about 45 minutes. If you’re using dry beans this will take about 2 hours. Now you see why I cheated! Let it simmer until beans are tender. In a pan, brown the chorizo. Yum! I’m sure at this point you’ve already eaten about 5 pieces. I know I didn’t. 😉 Remove the chorizo with a slatted spoon and transfer to another dish leaving the oil in the pan. Lower the heat and add the onion and cook for a few minutes. Add the garlic and bell pepper and paprika. Cook for another couple of minutes. Transfer the contents of the pan to the pot with the beans and stock. Mix to combine. Add the saffron. Now it’s a waiting game. Make sure your beans are tender. Add some salt if it’s too bland and cook it until the beans are at your desired tenderness. Add the kale and stir it in to wilt it. Make sure to only use kale leaves and not the stalks. You can add a capful of white vinegar if you so desire. It gives it a nice kick! This is way better compared to having shared web hosting service or dedicated server. Some of them deliberately move slowly, in order to get more money; therefore, you must always confirm the prices from the company. It is therefore important to look more closely into the type of internet marketing services that are offered by a company before you decide to hire them. And once you learn about the law of attraction, you will begin to see why this is so. in proportion to the thoughts you entertain within your mind. If we’re anxious about going to work, is it time for a change.